On Friday I went to visit a friend who is going away to live. We very rarely see or speak to each other (maybe 2 or 3 times a year), yet there is a connection between us which is not determined by length of time. After a few hours, when I was leaving, he presented me with a simple package (a sealed brown envelope containing a hard lumpy object, a letter and a CD of his original music created over the years from 2000 - 2006). I left his house and went to see one of the European Films at Movie Towne. As I pulled into a free parking space, it started to rain heavily. Rather than run out, get wet and then freeze in the already-freezing Movie Towne air conditioning, I stayed in the car and opened the envelope. 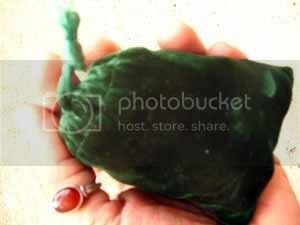 The first thing I examined was the hard lumpy thing which turned out to be a small, deep green velvet bag which smelled strongly of incense. 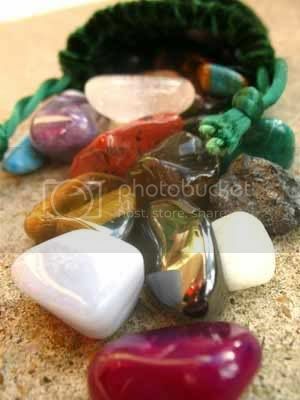 So much so that I thought that's what was in it ... but loosening the drawstring revealed a glistening rainbow of stones of all kinds - semi precious ones like amethysts, crystals, citrine, jasper, hematite, etc. 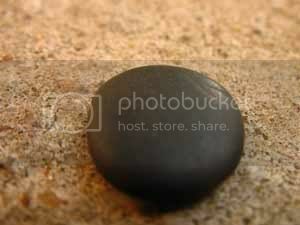 as well as one or two small 'normal' stones like those flat grey ones found in a river. Wowed, I sat there staring at them. I then read the letter, which made my hair raise, not only because of the beautifully expressed sentiments of friendship (simple, but powerful, like the bag of stones), but also because of what was said about the stones. On their own they were beautiful enough, but what was written added other dimensions. The first line of the letter simply stated 'Forty stones, forty years." They are part of a collection my friend began in his childhood when he lived in the States. It moved me deeply to receive this. Out of the whole bag, this is my favourite stone: a flat, cool river stone, not even quarter of an inch in size. That is the most beautiful gift I have ever seen. What a wonderful friend. Chookooloonks sent me here, and I am inspired. Agreed, what a spellbinding gift. Thanks for stopping by, Kristin. That's beautiful. What a wonderful thing to give or to receive.